It is finally here. 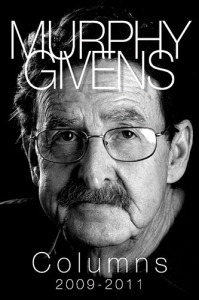 For years readers have been asking of a collection of Murphy Givens history articles. Columns 2009 – 2011 is a compilation of nearly 100 newspaper columns written by Murphy Givens about the history of Corpus Christi, the Nueces Valley and South Texas. The columns document the people who strove to make South Texas their home. Adventurers, outlaws, settlers, cowboys, ranchers and entrepreneurs from the United States, Europe and Mexico all came to the Coastal Bend of Texas, struggling against nature and their fellow man to make their homes and livelihoods. Columns includes 138 photographs and maps and a full index.